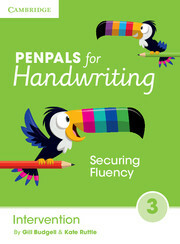 Penpals for Handwriting is a complete handwriting scheme for Foundation (ages 3-5) to Year 5/6 (ages 10-11) (P7/8). It covers the handwriting objectives in the National Curriculum and National Literacy Strategy and supports the Curriculum Framework for Children 3 to 5 (Scottish Consultative Council on the Curriculum) and Curricular Guidance for Pre-School Education (Northern Ireland Council for the Curriculum, Examinations and Assessment). It also aligns with guidance on handwriting in Developing Early Writing (DfEE 2001). Penpals for Handwriting offers a practical approach to aid the delivery of handwriting teaching in the context of the modern curriculum, working through whole-class activities, independent tasks, home links, review and assessment.